Check these guys out--The Wiyos! This has been a hectic week--and it ain't over. But I managed to put together this playlist for broadcast tonight at 8 PM ET on WHCL, with some nice new acquisitions of great 78s, a stab at fixing other peoples' mistakes, and a few recent recordings by worthy musicians. Enjoy! Every year I have to get clever. This year I decided to go cryptic as well. Tune in Friday at 8 PM ET on WHCL to hear what it's all about. We're in for the long haul on this Copyright Royalty Board thing--and there is a possibility now more than ever I will have to pull the plug on my Live365 stream by this July. (The WHCL broadcast and webcast will continue as before.) Therefore, I would urge you to download all the RADIOLA! programs you can HERE. They're now up to date through last Friday's show. NEW! 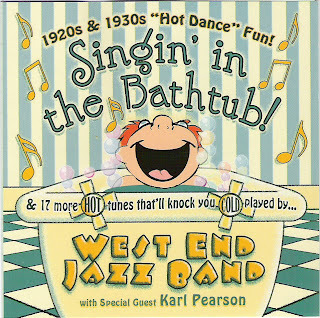 "Singin' in the Bathtub" CD by the WEJB! Lots of crunchy goodness (and a few minty specimens) here for those who need their surface noise. 8 PM EDT on WHCL, of course. AL GALLODORO AT THE LITTLE FALLS LIBRARY!! 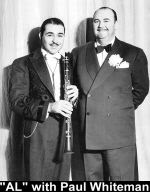 Al Gallodoro, the legendary reedman whom Jimmy Dorsey called "the best saxophone player who ever lived," will be playing with his quartet at 7 PM this Thursday, April 5, at the Little Falls Public Library (10 Waverly Pl. Little Falls, NY 13365-1517; phone 315-823-1542). Copies of Al's excellent new CD, "Daybreak: Lyrical Jazz" will be available for sale at the concert. Scroll down this page for more information on Al Gallodoro. Or, check out Al's new website.